Police fired live ammunition into a crowd of protestors in Thoothukudi, Tamil Nadu on Tuesday 22nd May 2018, killing at least 10 people. One more person died after being hit by a rubber bullet on Wednesday 23rd. Video footage from 22nd May shows plainclothes policemen on top of a parked bus taking aim and firing a rifle at protestors who were calling for the closure of a copper smelting plant in their locality. A person out of shot on the video is heard to say "At least one should die" before the officer took aim and fired. A report in The Hindu newspaper on 25th May claimed that at least eight of those killed had been deliberately targetted by police as organisers of the protest, with some, including a 17-year-old girl, shot at close range. By the time of writing, The Indian Express reported that the death toll from attacks on protestors in Thoothukudi had reached 13. 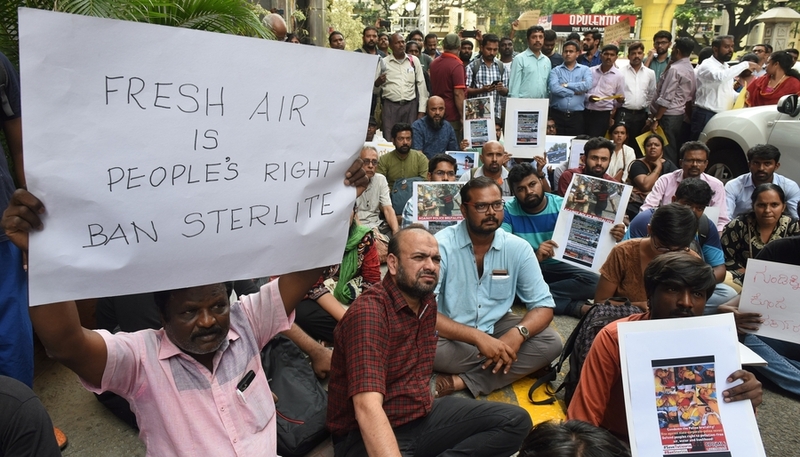 The shooting happened on the 100th day of protests against the Sterlite Copper plant, which locals accuse of polluting the air and water supply. The plant, which produces up to 400,000 tonnes of copper a year, is currently seeking to expand its capacity despite the strong opposition from local activists. Over two-hundred and fifty activists were arrested in February for a hunger strike to demonstrate their opposition to the expansion plans. Following the latest clashes, the government shut down the Sterlite plant, which had not been operational for two months because of compliance problems with environmental regulations. The local authorities also cut internet connections in Thoothukudi and surrounding areas as "anger and resentment against police action continued to smoulder." The Hindustan Times reported that 65 people had been arrested and charged for "engaging in violence" during the protests. Indian human rights activists spoke out and protested against the killings, resulting in a large number of detentions, including that of Henri Tiphagne, director of local civil society organiation People's Watch. Tiphagne and others were released later on 24th May. “The Tamil Nadu police were shockingly underprepared to peacefully control protests of this magnitude. Despite knowing there would be a massive protest on Tuesday, the state police did little to implement crowd control measures that would have avoided the need to resort to force. This could have prevented the death of protestors." Sterlite Copper is owned by Vedanta, a mining and minerals conglomerate, which has operations across India and several other countries. According to Vedanta's website, the company, which is owned by businessman Anil Agarwal, holds a 36% share of India's copper industry. It has been involved in a number of cases of alleged environmental damage, including cases in India and one in Zambia in which local villagers allege that its operations polluted the local water supply.